blocked to 7" x 63"
Why is this yarn grey when all the scarves for this project are supposed to be blue? The yarn came from Oze Yarn in Australia and of course the color on the monitor looked blue. The color is called Opal, which suggested blue to me. Be that as it may, the color, while a definite grey, does have a bluish cast and it is a very nice color. 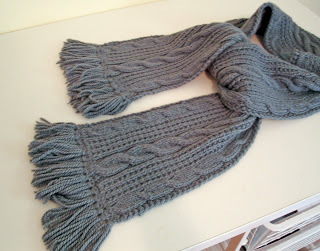 This scarf would suit a woman or a man. Blocked to 5.5" x 71"
This Cascade cotton blend yarn is excellent. Sierra is a cotton/merino blend (80/20). The wool adds bounce to the cotton so it is not so stretchy or heavy as pure cotton would be. Pima Silk is 85/15 cotton to silk and is very soft and silky. I have some stashed in a light pea green for a simple sweater which I want to reproduce from the shape and measurements of a store-bought one. blocked to 5.5" x 70"
This is the most spectacular of the scarves due to the spectacular Silk Garden yarn. Note also the cute corkscrew fringe from Nicky Epstein's Knitting on the Edge. 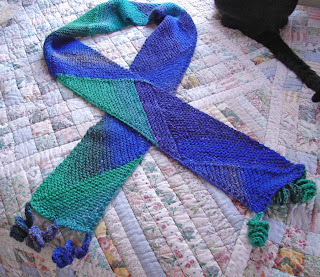 The scarf pattern is very cute and clever as well. In the case of Abarat, the yarn does all in work. 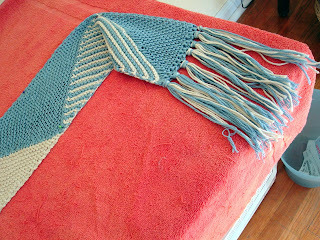 In the scarf above (Rococo) I tried to get the effect by changing yarns. While not bad, the effect is more subdued and a little rustic looking. I downloaded Photoshop Elements to help with the pictures. I think it did a good job on this one. It is especially good for color correction. Note the black cat tail in the upper right hand corner of the photo.